Dombai is the tourist and mountaineering center of the North Caucasus. There are not many places with equal natural wealth as the Dombai glade. Everything that attracts tourists and mountaineers is concentrated within this small area. Dombai is the climatic recreational area that is situated in a hollow at the foot of the northern slopes of the Main Caucasian Ridge, 26 km away from Teberda resort, at the height of 1600 meters above the sea level, at the confluence of the rivers Amanauz, Dombai-Ulgen and Alibek. The birth of the resort dates back to 1964 when the first rest homes and alpine camps were built. Later hotels, chair lift and cable car systems up to "Krugozor" station were built on the slope of Mussa-Achitara Mt. (2150 meters above the sea level). The Dombai glade is situated in the Teberda reserve. Dombai is often called "the heart of the highlands". It is surrounded with mountains, covered with coniferous, mainly fir, forests. Dark-green forests, the colors of alpine meadows, impetuous rivers, waterfalls, eternal snows and glaciers make this place extremely beautiful. 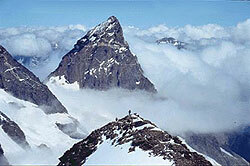 The highest peak in this area is Dombai-Ulgen ("The killed bison"- 4046 meters above the sea level). It is covered with eternal snows and glaciers. The climate of the Dombai glade is temperate continental with great number of sunny days, abundance of ultra-violet radiation and the unique purity of the air. The duration of the sun shining reaches 1420 hours a year. The mountain climate can be used for climate therapy all year round. The mineral waters that were brought out by means of boring and relate to carbonaceous hydrocarbonate- chloride sodium-calcium waters are the natural medicinal factor. From Dombai one can make many thrilling tours of the neighbourhood gorges. Excursions to the Chuchkhur waterfalls, Alibek glacier and Turie Lake are the most popular. From the top of Semenov-Bashi or Mussa-Achitara one can enjoy the great amazing panorama of snow-covered mountain chain that stretches for more than 30 kms and astonishes a tourist with its proportionality and combination of colors and shades. There is something majestic and mighty in it. From the "Krugozor" station one can enjoy the panorama of the Great Caucasian Ridge and be carried away to another world of silence, stone immobility, majestic summits, snow and ice. The western part of the Caucasian Ridge is so close to the south that from the top of many mountains in the region (Sofrudju, Bel-ala-kaya, Ertsog, Djalovchat) in nice weather one can see the blue sea surface behind the green hills.